The advancement and growth of the mobile industry has indeed triggered a number of business owners to design and develop mobile compatible sites for reaching out to the world. Recent researches have shown that the number of people using the Smartphone for browsing websites is slated to grow as against desktop/laptop usage. Since, the devices allow you to stay connected anytime and anywhere on the go, more and more people are relying upon their Smartphone, iPad, tablets, etc for browsing sites or buying service/products. 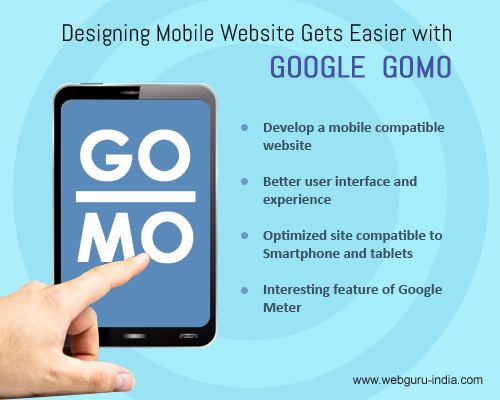 To make mobile website design easier, Google has lately introduced the GoMo software facilitating better user experience. It is probable that the common mass is not familiar with this software of Google, but website developers creating Smartphone and tablet compatible websites must be aware of the same. Likewise, business owners looking forward to developing sites compatible to Smartphone and tablets must also be familiar to the software. This software allows a better user interface and a friendly User experience to your website developed for a range of devices. It is always advisable for business owners and entrepreneurs to take maximum advantage of GoMo as this would surely help them create a niche in the industry. Google is referred to as the search engine giant and is most trusted by users for all kinds of search and surf purpose. Therefore, integrating Google GoMo in your website should have a great impact on the same. Transforming your mobile compatible site in GoMo would definitely facilitate a better user interface and experience, thereby enhancing your presence in the web largely. Smartphone has come up to be one of the most essential elements in the lives of people today. Be it for browsing a website or buying a particular product, more and more people are relying upon their devices to complete the search and surf aspects. The software from Google is loaded with high-end features that help developing an optimized site compatible to Smartphone and tablets for your business. It also allows you to design and develop a mobile compatible website at affordable prices. This particular technique stands as a great alternative to other expensive methods. Google GoMo comes loaded with the interesting feature of Google Meter. This feature allows you to go for a site test on a mobile device. The meter further helps you to find out about your business. Additionally, prospective users can also find out more about your business through this wonderful feature of the search engine giant. Google GoMo facilitates an easy and comfortable approach of mobile website design without the hassles of coding and heavy financial expenses. In general, designing a site compatible to your Smartphone and tablets involve lots of time and effort and the introduction of GoMo has fascinatingly made it easier. Owing to such advantageous features, GoMo is referred to as the quickest and useful solution to design and develop mobile sites. Today, more and more developers along with business owners are turning to the GoMo for its beneficial assets. To develop a business site compatible to latest devices in the market like Smartphone and tablets and to incorporate the rich feature of GoMo, business owners must always rely upon professionals holding the expertise and technical knowledge for delivering nothing but the best.